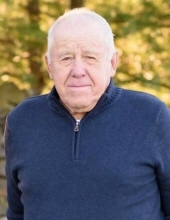 He had made a profession of faith in Christ, was a member of the Summershade United Methodist Church and also attended the Greensburg United Methodist Church. He was a farmer, employee of Don's Lumber Company, and a Veteran having served in the United States Army. He was a member of a leading, old line family, the son of the late Thurman Hancock and Thelma Squires Hancock, and the widower of Mary Sue Brown Hancock, his wife of 51 years. He leaves nine direct living descendants. Mr. Glen D. Hancock. 79, of Greensburg, KY, departed this life on Saturday, April 28, 2018 at his home in the Bramlett Community of Green County. The funeral services for Mr. Glen D. Hancock will be conducted at 10amCT, Thursday, May 3, 2018 at the Cowherd and Parrott Funeral Home, 206 S Main Street, Greensburg, KY with burial to follow in the Summershade Cemetery, Bramlett Road, Summershade, Greensburg, KY, with Bro. Dale Curry and Bro. Bill Davenport officiating. Visitation is requested 4pm-8pmCT, Wednesday, May 2, 2018 at the Cowherd and Parrott Funeral Home and after 7amCT, Thursday until time of the funeral service. Mr. Glen D. Hancock of Greensburg, KY, son of the late Thurman Hancock and Thelma Squires Hancock, was born on Sunday, June 26, 1938 in Green County, KY, and departed this life on Saturday, April 28, 2018 at his home in the Bramlett Community of Green County, KY. He was 79 years, 10 months, and 2 days of age. He had made a profession of faith in Christ, was a member of the Summershade United Methodist Church and also attended the Greensburg United Methodist Church. He was a farmer, employee of Don's Lumber Company, and a Veteran having served in the United States Army. He was also preceded in death on June 8, 2012 by his wife of 51 years, Mary Sue Brown Hancock, having united in marriage on June 21, 1960. Memorials are suggested to the Summershade Cemetery Fund or the Gideon Bible Fund, which can be made at the funeral home. The Cowherd & Parrott Funeral Home, 206 S Main Street, Greensburg, KY, is in charge of arrangements. 2018-04-30 - 206 S Main Street, Greensburg, KY - Photo from Cowherd & Parrott Funeral Home.